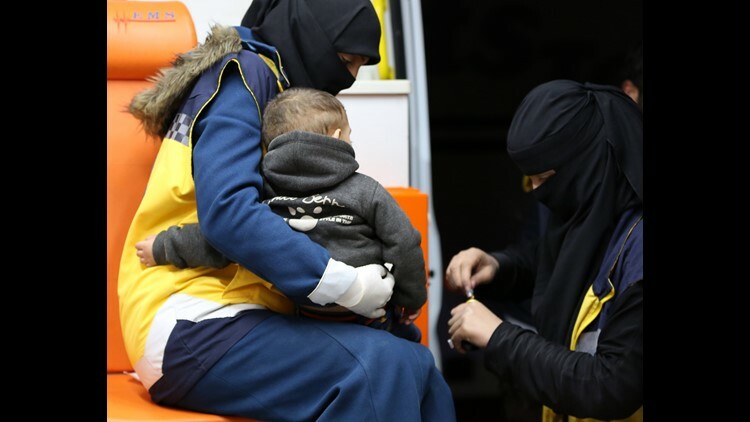 A child evacuated from Douma receives preventive medicine upon arrival in Al-Bab district, Aleppo, Syria, 11 April 2018 (issued 12 April 2018). The Kremlin on Thursday warned the U.S. and its allies, who are weighing military strikes on Syria, to avoid any steps that could destabilize the situation there. The U.S. has threatened to respond militarily to the alleged chemical attack near the capital of Damascus last weekend that killed at least 40 people, many of them children, in the town of Douma. The remarks by Dmitry Peskov, spokesman for Russian President Vladimir Putin, followed claims by French President Emmanuel Macron of "proof" that Syria used chemical weapons in the attack and a declaration that France will respond at a "time of our choosing." The Organization for the Prohibition of Chemical Weapons, an international chemical weapons watchdog organization said Thursday that its team is en route to Syria and will begin work Saturday to investigate the attack. 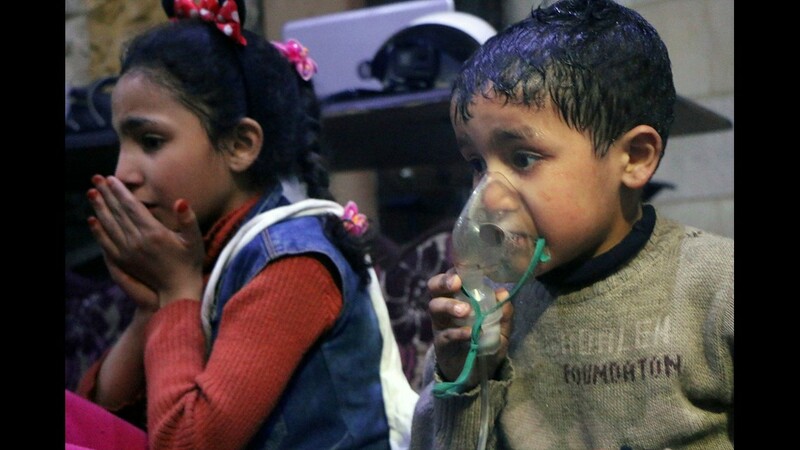 The Syrian government and Russia have denied a chemical attack occurred. Macron kept up the drumbeat for likely war with his claim of evidence that chemical weapons were used in the attack, although he did not elaborate. "We have the proof that chemical weapons — at least chlorine gas — were used by Assad's regime," Macron told France's TF1 television. Asked in a TV interview whether France would join strikes on Syria, Macron said, "We will need to take decisions in due course, when we judge it to be most useful and effective," according to Agence France Presse. "France will not allow any escalation that could harm the stability of the region as a whole but we can't let regimes that think they can do everything they want, including the worst things that violate international law, to act," Macron said. The French president, who said he was in daily contact with President Trump, said any strikes would go after Syria's "chemical capabilities." 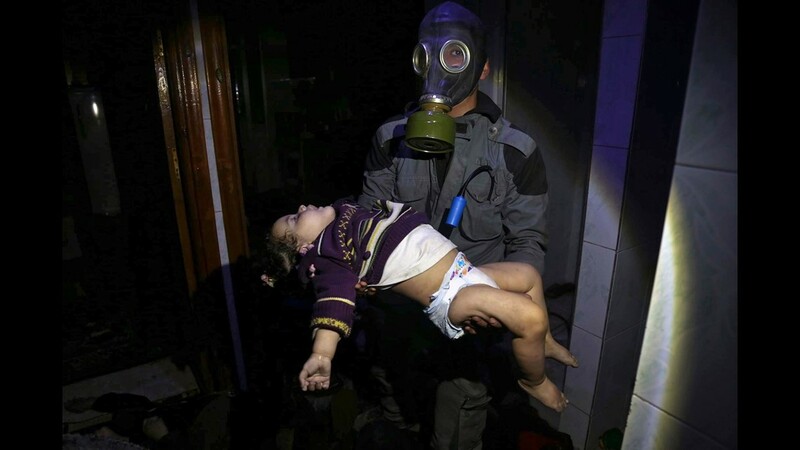 This image released early April 8, 2018 by the Syrian Civil Defense White Helmets, shows a child receiving oxygen through respirators following an alleged poison gas attack in the rebel-held town of Douma, near Damascus, Syria. Syrian rescuers and medics said the attack on Douma killed at least 40 people. The Syrian government denied the allegations, which could not be independently verified. The alleged attack in Douma occurred Saturday night amid a resumed offensive by Syrian government forces after the collapse of a truce. 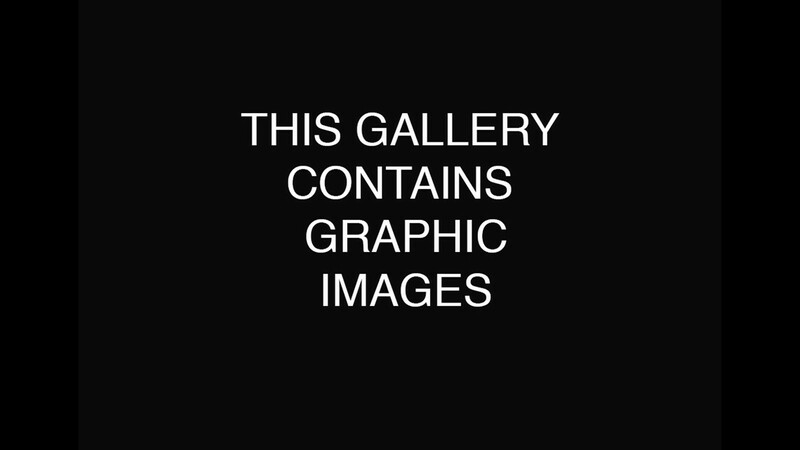 This gallery contains graphic images. 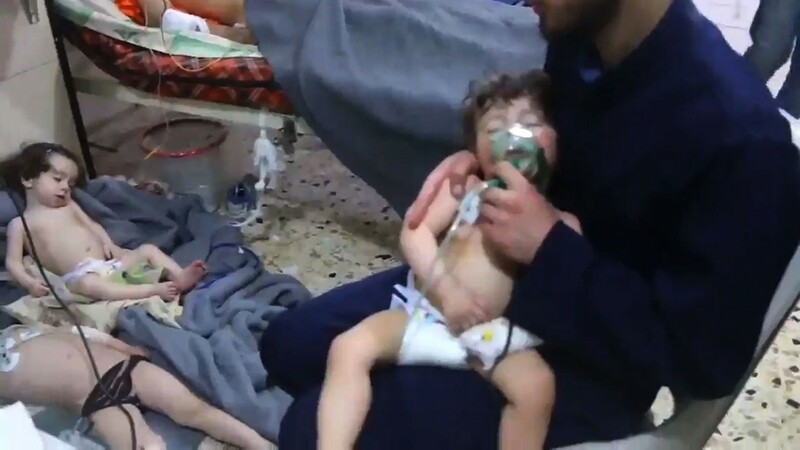 An image taken from a video released by the Syrian civil defense in Douma shows a volunteer holding an oxygen mask over a child's face at a hospital following a reported chemical attack on the rebel-held town on April 8, 2018. 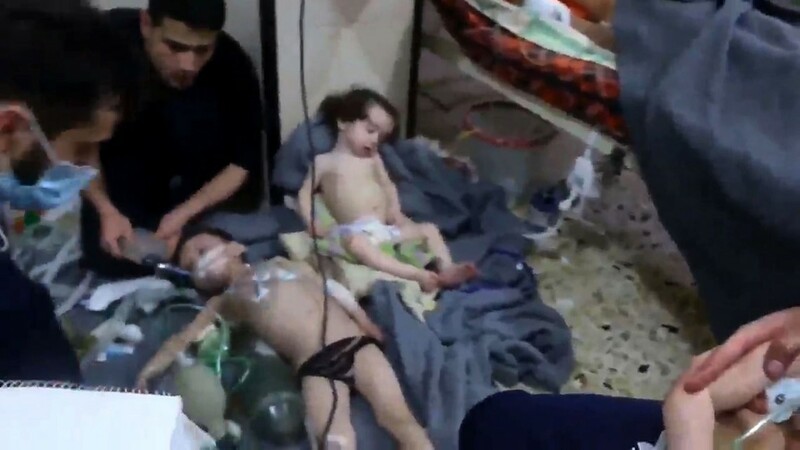 An image taken from a video released by the Syrian Civil Defense in Douma, Syria shows unidentified volunteers giving aid to children at a hospital following a reported chemical attack on the rebel-held town on April 8, 2018. 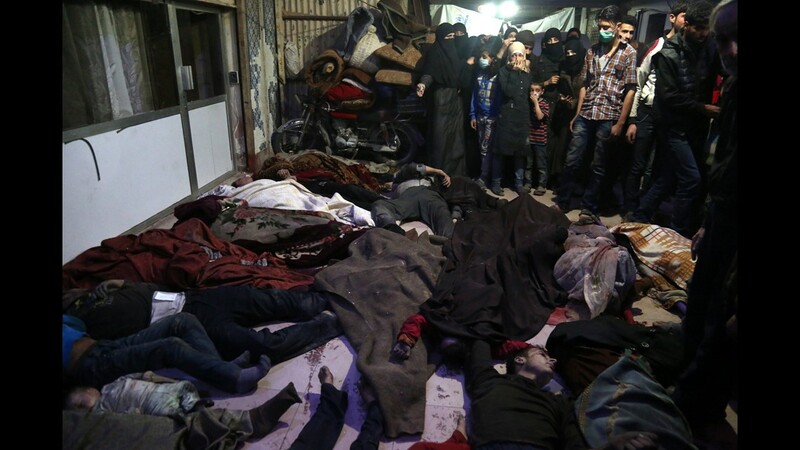 Bodies of victims of an alleged chemical attack lie on the ground in Douma, Syria on April 8, 2018. According to media and local reports, at least 70 people died after a helicopter dropped a barrel bomb allegedly containing Sarin gas, a nerve toxin that kills within minutes of direct inhalation unless treated quickly with an antidote. President Trump has sent mixed messages on the U.S. response, warning Russia in a tweet Wednesday to "get ready" for U.S. missile strikes in Syria in retaliation for the attack. On Thursday, however, he tweeted: "Never said when an attack on Syria would take place. Could be very soon or not so soon at all!" Amid the talk of military action, the Kremlin, a close ally of Assad, countered that more "serious approaches" were needed to combat the crisis. Meanwhile, the Russian military said the Syrian government is now in full control of Duoma, once held by rebels opposing Assad. However, there was no official announcement from Syria on the matter and there was also no indication of Syrian government forces entering the city Thursday. If confirmed, the town's seizure would mark the last stage of Assad's takeover of the rebel-held enclave of eastern Ghouta. Assad said Thursday that Western threats to strike Syria are based on “lies” and seek to undermine his forces’ advances near Damascus. He spoke during a meeting with Ali Akbar Velayati, an aide to the supreme leader of ally Iran. The talks stressed that threats of some Western countries to attack Syria, "based on the lies fabricated by these countries and their tools of the terrorist organizations inside Syria, came after the liberation of the eastern Ghouta and the failure of a new bet of those upon which these countries have relied in the war on Syria." Syria's official SANA news agency reported. “Whenever the Syrian army achieves victory in the field, some western countries rise their voices and intensify their movements in an attempt to change the track of events,” Assad said, according to SANA. The Syrian president added that the threats endanger international peace and security and that military action would only contribute to the “further destabilization” of the region.